Well, I have been working on this blog post for three days now and my computer has been on the fritz. Now it is behaving somewhat better, so I will continue with the account of our visit to Son #2 and his family over the weekend to see Em make her First Communion. This first picture is of Soph and Em in front of their house at Cotton Top Hills. The next picture is of Em at the church. She is holding her new rosary that I made for her. She got to carry the chalice during the presentation of the gifts at Mass. Em receiving her First Communion. Her dad is in the white shirt in the background, also taking pictures. Son #3 also came for Em's First Communion and brought her a beautiful big cross to hang in her room. 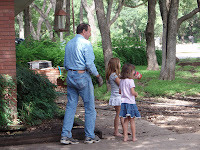 Soph and Em enjoyed visiting with their uncle and we were all sorry to see him leave so soon. We enjoyed eating together and Soph graciously shared her ice cream with Little One. Granddaddy says goodbye to Little One before we left. We had a wonderful time! Going to visit Son #2 and family and see Em make her First Communion. I made a rosary as a gift for her. One of the ladies in our parish had classes to teach anyone interested in making a rosary how to do it. It was fun picking out the cross, the medal in the middle section and all the beads. I think my choices turned out very nicely. Hope she likes it. I am very thankful for my blog. It has been so much fun learning how to create my blog and watch the format that has emerged. I was not sure that I would be able to master the technology required to do this "blog thing" that everyone was talking about--mostly the younger set, and I certainly am not very technologically savvy. However, I wended my way through all the setup process, learned to insert pictures, and have gotten over the nervousness of having my writing "out there" in cyberspace. I have enjoyed sharing pictures with my family and reconnecting with cousins whom I have not seen in years and years. That probably has been my number one delight along with comments from family members! Next I have enjoyed putting some of my family history stories together with old photographs and posting them for our family to read. I even have one "hometown" reader who seems to enjoy my stories of her town long before she lived there--or was even born, for that matter. And the blog is a nice way to keep family members informed about what is happening in our spread-out family! Yes, I am truly grateful for my blog and the opportunities that it has provided for me and for my family. Son #4 and wife and almost-two-year-old, Ella Bella came for a quick visit yesterday. Ella Bella stayed to entertain us while her parents ran a number of errands in the big city and we had a great time letting her take care of us. First we took her to the neighborhood beauty shop for kids and got her a haircut. She chose to sit in the red fire engine car to have her trim and was very, very good and still during the haircut (which took about five and a half minutes!). Ella has a new cow from her grandaddy. She had said to him last week on the phone, "Buy cow," so Granddaddy found one for her and it even says "Moo!" in a very deep voice! She decided she needed to take her cow, and an elephant puppet our neighbor gave her, for a ride in her stroller. She and I went all over the neighborhood looking for the deer but never did find them. She said they "went nighty-night." She was probably right! Next she spent some time with her Granddaddy and decorated his new lumber with her lovely art work--long flowing lines with a black permanent pen that he loaned her. She does have a flair for the abstract! 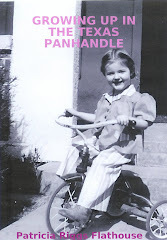 She was very careful not to get any black ink on her clothes and very little on her hands. Granddaddy decided she needed some lessons in hammering nails, so he gave her a dainty little hammer and a big nail and she knew exactly what to do with it. She has amazing hand-eye coordination and hit that ole nail on the head--without hitting her fingers! Her father has trained her well! We had a wonderful time with Miss Ella Bella! Aunt Patty was my mother’s unmarried younger sister. I was named for her. She was really an unusual person and when I was young, she lived with us and often went on vacations with us. As I grew older, I really enjoyed talking to Aunt Patty because she never seemed to see things like other adults. I think she never quite grew up and retained some of a child’s way of thinking about the world. Aunt Patty was short and petite. 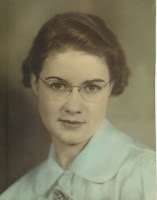 She wore thick glasses and had beautiful skin—even up until the time she died. She always dressed well and collected many things. Her house was filled with tiny ceramic animals, owls, statues of saints, medals, and unusual musical instruments that she never quite mastered. When I was seven Aunt Patty let me stay with her for a while after my brother was born and Mother was sick for several months that winter. I resented having to stay with Aunt Patty because Mother took my new brother and my sister and went to stay with my grandmother. I loved going to grandmother’s house and felt left out. I stayed with Aunt Patty in her tiny apartment with the Murphy bed and I slept on her couch. She always cooked a post roast on Sundays and then it seemed like she fed me ground roast beef sandwiches every day. I cannot stand the thought of those sandwiches now. I was so glad when my mother returned and rescued me from those ground beef sandwiches. 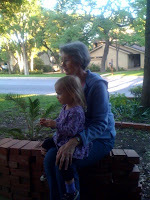 When my grandfather died, Grandmother moved in with Aunt Patty in Pampa. At first they lived side by side in the Kelly Apartments, just a block from our house. 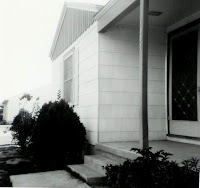 However, they soon moved to a house that Grandmother rented at 1901 Duncan Street. I am not sure Aunt Patty was all in favor of that, but Grandmother thought that was the way things should be. Grandmother and Aunt Patty lived together about twenty years. After about five years of living near us, Aunt Patty decided to move to Colorado Springs where we had spent some of our family vacations, and, of course, Grandmother went with her. 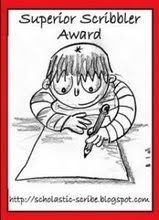 During those years, we got lots of letters from Grandmother and Aunt Patty and we visited back and forth. Looking back on it, I think Aunt Patty was never too happy during those years of her life. We always received lots of letters filled with grave details of her many and various ailments. I believe she was always looking for a fairy tail life with a “living happily ever after ending” and she never found that kind of happiness. She continued to live alone in Colorado Springs even after Grandmother died. We visited her the last time in 1999. Through the years the unusual letters, antics, gifts, and activities of Aunt Patty always amused us. Most special to us were her Christmas presents. We miss those crazy gifts now that she is gone. Her gifts at Christmas (and sometimes on birthdays, too) were large boxes of the most unusual things imaginable—inexpensive things she ordered from mail order catalogs and magazines plus things she bought from Wal-Mart or the drug store. Her gifts to our family rarely ever matched the person she sent it to. We usually saved her box of gifts until the last to open with groans and then laughter at what she had sent. We giggled as we unwrapped the packages and tried to figure what they might be used for—often trading out our gifts. Christmas has lost some of its fun in the years since she died. My final laughter came when Aunt Patty died and everyone gathered for her funeral and burial. I am told that the cousin in charge of her affairs opened the envelope containing her last wishes and began to roll his eyes. 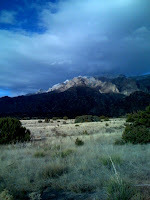 He told us that Aunt Patty wanted to be buried in a plain pine box standing straight up facing Pikes Peak in a plot she had specifically chosen at the cemetery. The funeral home people also rolled their eyes and said, “No!” The plain pine box did not meet funeral codes and they would not even consider the “standing straight up” part of her wishes, so Aunt Patty is probably resting uneasily, having been buried in the “normal” way—but “normal” she was not and I miss her in our way-too-normal family! I am thankful that I decided to begin taking oil painting classes last January. I had painted years ago--before I got married and for a while after I married, but then gave it up for other endeavors, like raising four boys. The oil paints and brushes had been stored in the garage for those many years, but most of the supplies were still usable. Amazing! This past week I finished another painting. It was one I began when my brother sent me a picture of the snow on a mountain near his home. The photograph of the picture does not do it justice. My next painting is a single bluebonnet. It seems like it will be a lot of work with all those little flowers on that stalk and all those leaves. I have the background in now, but still need to work in more background and begin the leaves and flowers. I will take a photo of it when I finish it. Otherwise, I am considering beginning a landscape with a path leading into some trees and I am having lots of fun dreaming of all the pictures that I am going to produce! A wonderful thing about our family is that we believe in family get-togethers that help us stay in touch with each other in a wonderfully refreshing way. This past weekend my brother and his wife came to stay with us and help celebrate their granddaughter's second birthday. We had three fun- filled days of activity--eating, visiting, and watching Bela enjoy her two-year-old self! My brother certainly enjoyed holding Bela, as you can tell from the big grin on his face, and playing with her during a breakfast gathering of family. My brother's wife with the Birthday Girl. Thankfully my brother's wife is feeling much better and is now able to attend these family gatherings after being "grounded" for a whole year! We were so glad to have her with us again for the fun and festivities. The Birthday Girl certainly enjoyed her birthday cake at the outdoor birthday party. The weather was gorgeous over the weekend and very conducive to outdoor gatherings with cool days, no wind, and little humidity. More good food and that delicious cake to finish up with! We all probably won't need to eat again for a week! We tried a family portrait of my brother, his wife and their oldest son's family. About ten pictures later I finally got one with everyone's eyes open. And no gathering is ever complete at our house without watching Bossy Mama and her girls come in to eat. Bela really enjoyed the deer and was amazingly quiet while watching them. Several times she put her fingers up to her lips and told us "Shhh!" to remind us to be quiet also. And one last picture of Bela sitting quietly in my lap outside for a very long time--just watching those deer eat. Thanks to all who came and made the weekend so much fun! I have mentioned being thankful for the the wildlife in our neighborhood before. Today I would like to be thankful for Bossy Mama and her friends who came into our lives several years ago. She is a beautiful doe who wanders through our suburban yard periodically and is obviously the leader of a pack of 10 to 15 deer. 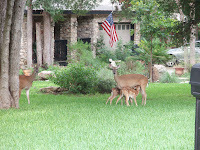 Several summers ago our grandchildren were coming to visit and they always loved to see the deer, but the deer did not always come around during their visits. My husband decided to provide water and food for the deer so that the grandchildren could see them on a more regular basis. He researched the best food for the deer and put it out in a small dish near the front windows of our living room. 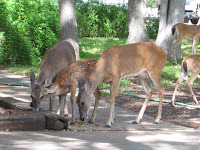 The deer began coming in almost every day and my husband has continued to feed them. We have now made friends with them and named a few of our favorites. Bossy Mama always appears in our yard and checks out the food dish. If there is food, she somehow communicates this to "the tribe," as we call them, and they come running down the street. Bossy Mama eats, but I have also seen her clobber a deer with her hoof for being too greedy. She keeps those deer in line! If there is no food out for the deer, Bossy Mama watches us with her soulful eyes and almost seems to talk. She has also been known to stomp her foot if we are slow to put out food and she will march into the garage, if the door is open, and begin eating the food my husband stores in there. Recently, my mother and I were leaving in the car and Bossy Mama was standing by the driveway waiting to sample the smorgasbord in the garage when I hit the button to close the garage door. It was comical to watch her expression of surprise and disgust as she looked from us to the closed garage door and back again. She actually stomped her foot and snorted at us! Mother and I had a good laugh over Bossy Mama's reaction! We really enjoy the deer who inhabit our neighborhood and our grandchildren enjoy helping my husband put out food for the deer. We then go into the living room for a front row seat of entertainment. In the early part of the summer Bossy Mama is the first new mama to bring her babies for us to admire. She always has twins and is a very good mother to them. They follow her around for a year or two until they begin to have their own families. 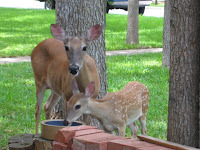 We have noticed that Bossy Mama is partial to some of the grownup deer and we suspect that they were her babies. Last summer I had surgery and was in bed for a couple of weeks. Each afternoon one of Bossy Mama's young bucks that we have named Bush Buck came and rested behind the bushes in front of my bedroom window. About 3:00 each afternoon he stood up and looked in the bedroom window and began moving his mouth like he was talking to me (or maybe chewing his cud). I talked back to him and we carried on a conversation for five or six minutes until he wandered off down the street. Even now, I sometimes find Bush Buck between the house and the bushes looking in the window. I always wonder what is going through his mind when he is outside looking in. Mother is 93 today. We had a little party for her and she seemed to have a great time. My brother's son came with Bela to help Great-Gram celebrate her birthday. It has been a beautiful day for her with presents, cards, balloons, candy, and flowers. Thanks to all who helped make her birthday a happy one. We have a neighborhood consisting of about 20 houses on two cul de sacs. Some of the houses have been inhabited for 40 years or more by the same families and some houses have new families with young children to liven up the neighborhood once again. One of the wonderful things about living here is that we all tend to look after one another and share our interests, talents, and problems. It is like having an extended family all around us. Last night one of the neighbors invited us to gather in his backyard around a cozy fire in his "cowboy cooker" for a "Welcome Spring" evening. We discussed neighborhood events and activities, upcoming elections, and laughed and visited for several hours. It is a wonderful neighborhood and we are very fortunate to be part of such a special place. For seven years I went to Holy Souls Catholic School with two grades in the same room. The summer before I began my eighth grade year, my parents decided to transfer me to Pampa Junior High School, not too far from our house. Finally, I was able to go to school with all the neighborhood children. A whole group of us walked to school together, down Browning Street to Cuyler, where the two story, yellow brick school building stood. The gymnasium was in one corner of the city block and the school in another portion of the block. The school building is no longer there, but my memories of it are still vivid. I recall the musty, old book, and dusty chalkboard smell that struck my nose the first time I set foot in that building. The latter part of my seventh grade year, I fell madly in love with a cute neighbor boy, Billy, who lived just a block from us. Now, hopefully, we would be in the same classes and could walk to school with each other—maybe even do our homework together after school. Oh, yes! My daydreams were extremely specific along those lines. I went to register for eighth grade. My neighborhood friends had warned me repeatedly to avoid—at all costs—getting the dreaded Miss Clubb. She had a reputation of being the most terrible history teacher in the whole school! I quaked in my boots when I heard her name because she had such a frightful reputation. In my worst thoughts about her, I could see her stomping around the school in huge combat boots with a big club, making life miserable for all the students. On the first day of school I was holding my breath to see what teacher I had for history. I just knew that I would die a slow and horrible death if I got Miss Clubb. I had had weeks of nightmares about being in her class. I was nervous about starting a new school anyway, but the thought of having to spend a whole terrible year with Miss Clubb was almost more than I could endure. That first day I looked at my class assignments and, naturally, I had Miss Clubb for history and my world came clattering down around my earlobes—and to make matters worse, Billy was not in any of my classes. I was certain I would not survive my eighth grade year. I went home sobbing and hoped my mother would bail me out. Instead, she encouraged me to try a few days in Miss Clubb’s class. That was not exactly what I wanted to hear, but I trudged back to school the next day—walking slowly and dragging my feet as I followed Billy to school. I was way too shy to ask if I could walk with him, so I followed about a half block behind, like a lovesick puppy. As the days turned into weeks, my time in Miss Clubb’s history class was surprisingly interesting. She was a strict disciplinarian and did not allow any mischief in her class. To be truthful Miss Clubb turned out to be a tiny, soft-spoken woman with white hair braided and pinned up on top of her head. She gave us difficult assignments, but I became wrapped up in them and developed a real love for history as the year progressed. I will always be grateful to “the dreaded Miss Clubb” for treating me to a priceless year of history in her class. And I learned an important lesson—not to always believe my friends and their assessment of teachers. While my love for history blossomed and grew that year, my puppy love did not flourish because, in my shyness, I never did figure out how to engage in conversation with Billy. It was not until several years later that we became friends and I learned that he was just about as shy as I was. We still stay in touch with each other occasionally, almost 50 years later. We met recently at a class reunion and he is still very sweet and cute. Sigh! Back in January I said that I was going to begin oil painting classes and wanted to paint two pictures. I am thankful to say that I finished the first one yesterday and am very proud of it. I have been working on the mountain picture and do not have it the way I would like to have it yet, but will continue working on it in the next couple of lessons. Next, I want to paint a bluebonnet picture, so I have pulled out several bluebonnet pictures and want to find one of a single bluebonnet that I can paint in a small painting. Here is a picture of my finished painting--not framed yet, but I am thankful that it is finished and that I am pleased with it!